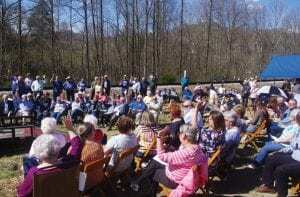 It was a simple event that might normally draw a couple of dozen people in Letcher County. 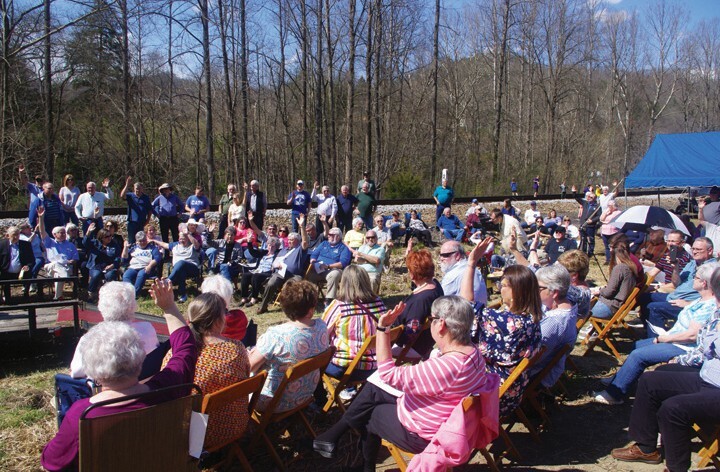 But the dedication of a historic marker Saturday on KY7 South drew 150 people, and showed that while the event the marker commemorates occurred 53 years before, the pain was still fresh for the community. 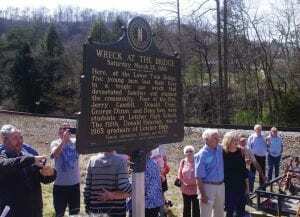 Family members, classmates, neighbors and would-be rescuers gathered Saturday on a brilliant spring day, just four days after the anniversary of the tragedy, to dedicate a historical marker at the lower “Twin Bridge” at Letcher, the site of a car crash that left four high school students and a recent graduate dead. Bob Banks, who grew up near the wreck site and was 10 years old when it occurred, spearheaded the efforts by the West Letcher Oral History Society to have a historic marker placed at the site of the crash. The group raised the money required through donations, and also raised enough for a reception after the dedication. Banks did not speak at the dedication, but others credited him with pursuing the issue. The Kentucky Historical Society doesn’t normally place markers for car accidents, State Rep. Angie Hatton said. “Mr. Bob Banks and the West Letcher Oral History Society are the worst people I ever saw at taking no for an answer,” Hatton said. In the end, it wasn’t the wreck itself that changed their minds, but the impact it had on the community, proof of which, Hatton said, was the crowd gathered between the railroad and the highway to see the marker unveiled, and pay their respects to the dead. “They were deaths so tragic that the wounds in this community never healed,” she said. The story of the wreck spans generations. Letcher County Judge/Executive Terry Adams, who was born three years after the crash, said his father was one of the first people at the scene, and he grew up hearing the story of what happened and how horrible it was. Richard Smith, chairman of the West Letcher Oral History Society, graduated high school with the oldest of the crash victims, and lived just up the road. The accident occurred the night of May 26, 1966, as the five were returning home to Ulvah from a movie. At that time, the Twin Bridges were “Bailey Bridges,” prefabricated, steel truss bridges that were designed by the British during World War II to be portable and quickly installed and removed. The lower bridge, the one farthest downstream, was well known as a dangerous spot because of a curve on each side of the one-lane bridge and a slick surface. According to a story in The Mountain Eagle that week, Don Crase, 16, and Douglas Ison, 17, juniors at Letcher High School; George Dixon, 18, and Jerry Lee Caudill, 16, seniors at LHS; and Donald Halcomb, 18, a 1965 graduate of LHS, had apparently been to a movie when the car they were riding in went off the bridge and into Rockhouse Creek, where it caught fire. All five died on impact, reports said. There was no fire department in the community, and the only ambulances were run by funeral homes. There were no emergency medical technicians or paramedics. Bystanders put out the fire and pulled the bodies of the five boys from the wreckage. Danny Dixon, a brother of George Dixon, thanked those who did that when he climbed onto the small utility trailer serving as a stage. He looked out over the crowd gathered for the dedication, and noted how alone he felt in his grief. Other family members also spoke during the dedication. Jerry Caudill’s sister, Nina Mae Caudill, lived with her husband in Ohio when the call came, and their car’s transmission was torn up. Her husband, James Caudill, recalled that a garage fixed it free when he told them they had to get to Kentucky because of the accident. Billy Crase, a nephew of Donald Crase, said he was only 7 years old when his uncle died. “We got the call late at night up in Indiana. Dad put us all in the car and dashed down here,” he said. The car was still in the river when he arrived, he said. Elder Elwood Cornett gave the address for the day, saying he was “touched and amazed” at the program. The community, he said, was brought to its knees by the loss of the young men. “The funerals, one after another, only hinted at closure,” Cornett said.